Waterford Institute of Technology (WIT) in cooperation with Institutes of Technology Ireland (IOTI) is very pleased to offer degree completion pathways for Colleges Ontario (CO) students on Bachelor degree programmes. WIT is unique in the IOTI network as it has a longstanding relationship with many colleges in Ontario and has been involved in student and staff exchange for many years with Centennial College and Humber in Toronto and Fanshawe College in London, Ontario. WIT also has active exchange partnerships with Memorial University in Newfoundland and the University of Fraser Valley and JIBC in British Columbia. Under an agreement signed between IOTI and CO in 2011, graduates of two-year college programs in Ontario can study for an honours degree with two further years of study in Ireland. In some cases, graduates of three-year programs will be able to secure an honours degree with one further year of study. Applications are now invited from Colleges Ontario graduates who wish to pursue honours degrees in all disciplines. For Colleges Ontario students, tuition fees for our undergraduate programmes are €7,500 for the academic year 2017-2018 ($11,000 CAD approx). We periodically visit Colleges in the Ontario network and work with local agents Barclay & Knap and KOM Consultants. When exploring where to finish your undergraduate degree, why not choose Ireland!? The people are good ‘craic’, the scenery is beautiful and the opportunities for travel and adventure are endless! Waterford itself is located in the 'sunny south-east' which is close to amazing beaches, rocky cliffs, classic Irish scenery (sheep and cows) and surfing on the coastline. 2. 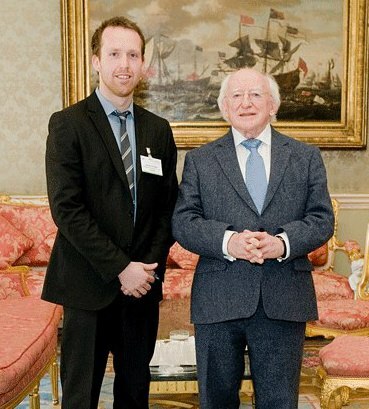 Getting involved with Education Ireland as an International Ambassador and having the opportunity to meet the Education ministry and the Irish President, Michael D. Higgins. 3. Exploring Irelands beautiful countryside and taking weekend getaways all over Europe. 5. Partaking in the numerous International Society events and activities. Presentation of Education in Ireland Student Ambassador certificate by President of Ireland, Michael D. Higgins to Cameron Bradley, WIT Canadian Student Ambassador.